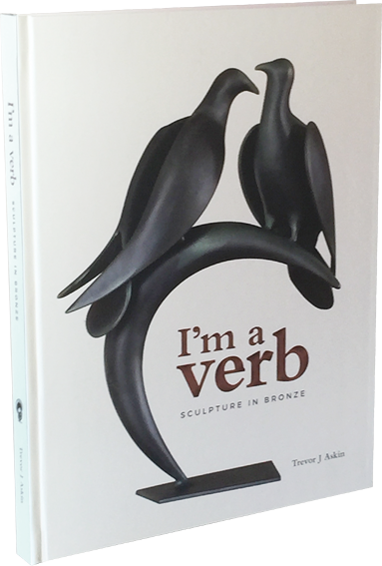 Recorded in this newly published book is the majority of the 600 works in bronze done over the nearly 40 years I've been sculpting. 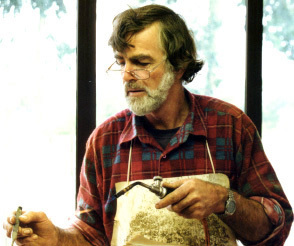 He began sculpting around 1980. 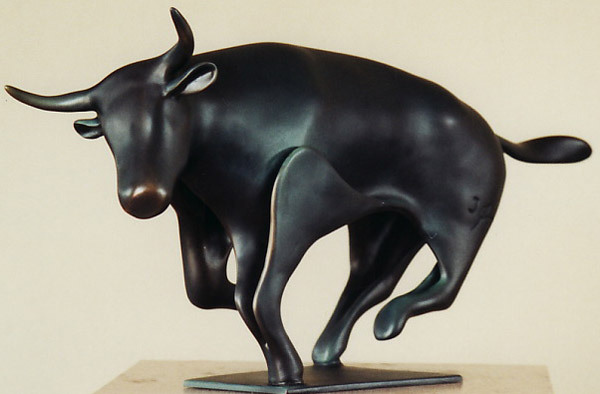 As he wished to carry out the whole process of creating a bronze himself, thereby having control of his work from start to finish, he also started learning the different processes required to create a bronze sculpture using the age old “cire perdue”, lost wax, method. Has now completed over 500 works. He starts with a lump or sheet of wax and when he has sculpted the shape he wants he adds a wax sprue cup, various gateing and venting. This has a two fold purpose, (1) to allow wax to escape during the burn-out and (2) an opening for pouring the molten bronze into. The next stage is coating the wax sculpture in a ceramic mould, this is done over a period of a week, the ceramic shell being built up using high tech refractories one coat at a time with adequate drying in between each coat. After two more days the ceramic shell coated wax sculpture is then placed in a hot burn-out furnace and the wax melted out. The hollow ceramic mould is then calcined in a hotter furnace to strengthen the shell mould so it is able to withstand the thermal shock of molten bronze being poured into it. Having a good "melt" of bronze is very important and a faculty one develops over time. Bronze ingots are put in a crucible in the furnace (the crucible full of bronze weighs about 45 kg). It takes about an hour for the bronze to melt and reach 1240 °C (2264 °F). The bronze is poured into the moulds at about 1190 °C (2174 °F). The ceramic shell mould can be broken off after 30 minutes cooling and then the fettling begins - cutting off the sprue, gates, etc and sanding the surface smooth. 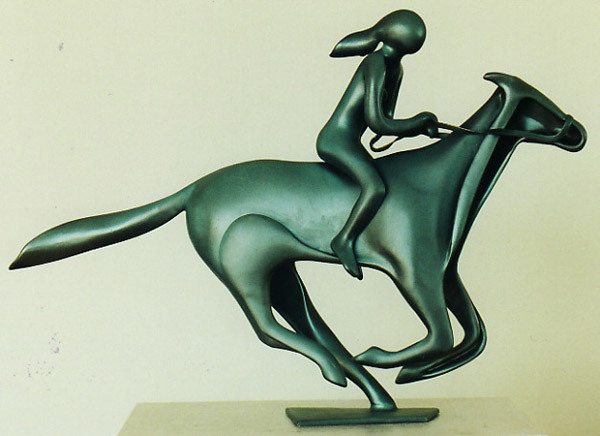 The final stage is applying the patina which gives the sculpture its colour, either brown, black or blue. A thin coat of wax is applied to keep the surface from marking when handled. Has been sculpting since 1980. Has his own studio, foundry and gallery. 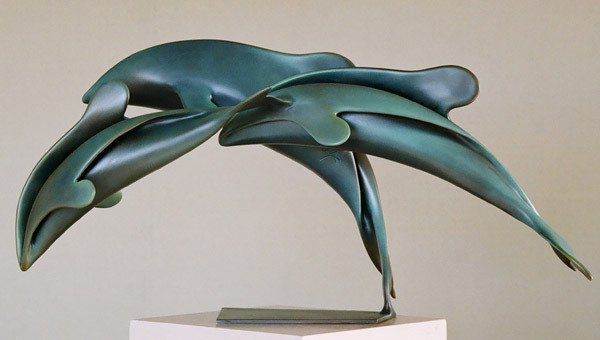 During the first few years of his sculpting career Trevor worked mainly on representational sculpture - a necessary discipline for any artist, however after about five years he found himself developing a more free and flowing style of sculpture which is unique to him. 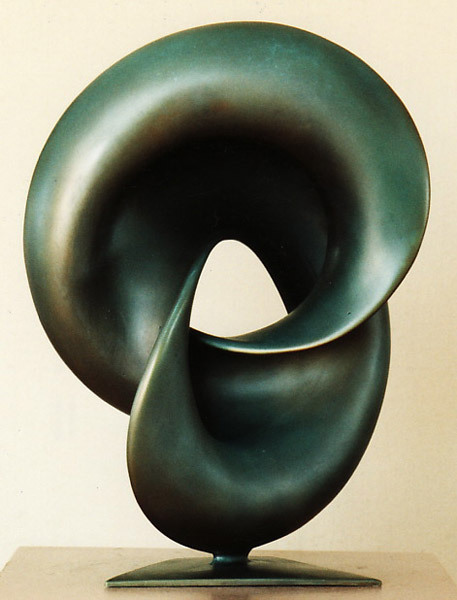 He calls this unique style ‘curvilinear’ and these works are widely sought after by collectors. 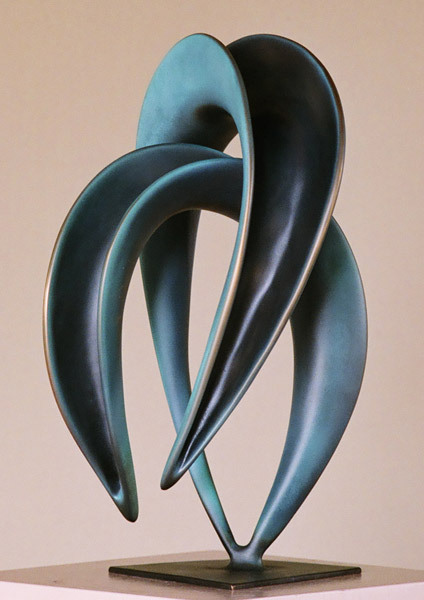 His ‘curvilinear’ pieces are one-off sculptures - he does not have a master mould for any of these works. He does his own casting with certified bronze ingots using the ‘cire perdue’ (lost wax) method in ceramic shell moulds. 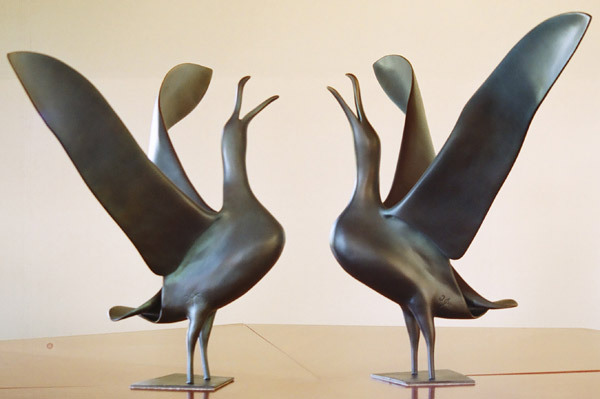 Enjoys creating sculptures that are uplifting to the spirit, but also finds the need to express his feelings of hurt and despair by creating caricature, whimsical or abstract sculpture. Is an elected Artist Member of the New Zealand Academy of Fine Arts. 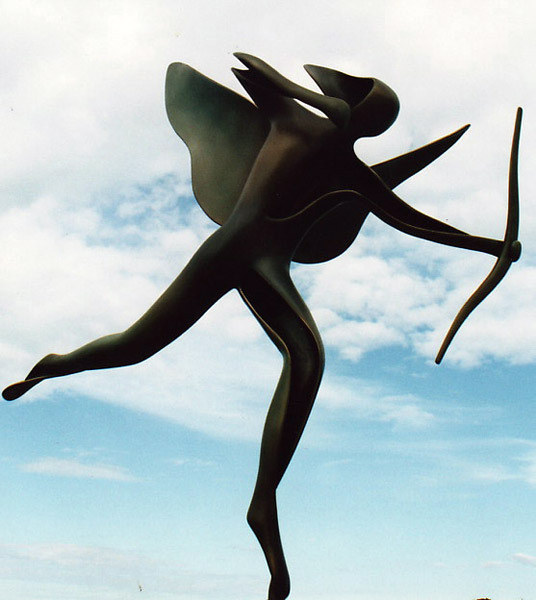 International commissions include nine bronze trophies for the 1995 World Gliding Championships and a bronze centre-piece for the 10th World Rose Convention in 1994, the latter is installed in the Rose Garden at the Mona Vale public gardens in Christchurch. Commissioned by the Timaru Beautifying Society to sculpt the ‘Paper-boy’ a life-size bronze installed in the city of Timaru in 1997. Commissioned by The Blacksmith Memorial Committee to create a three-quarter life-size bronze sculpture of a blacksmith which was installed at Orari in January 2006 in recognition of the pioneers of the Orari District as well as others. His works are in private collections in the United States, Canada, England, Switzerland, Japan, Netherlands, Belgium, Germany, Australia, Singapore, Hong Kong, Korea, France and New Zealand. 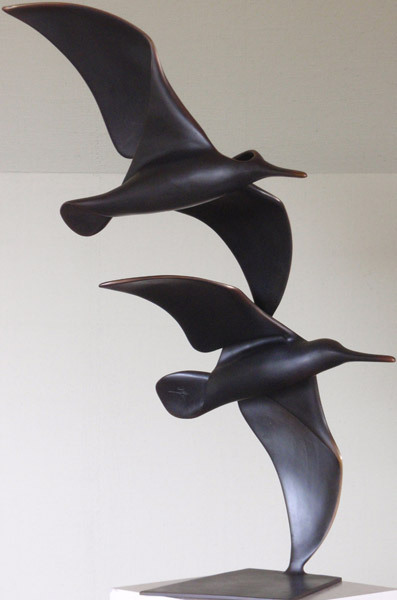 His work is on exhibition in Timaru, Christchurch, Wellington and Auckland.